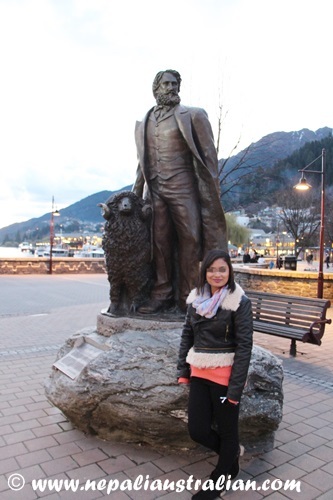 I had been to Queenstown before but still every time I visit New Zealand I get excited. 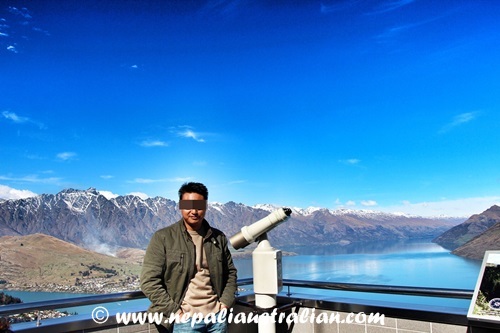 It was AS’s first time to South Island and I was excited to be there with him to enjoy the natural beauty of the country. 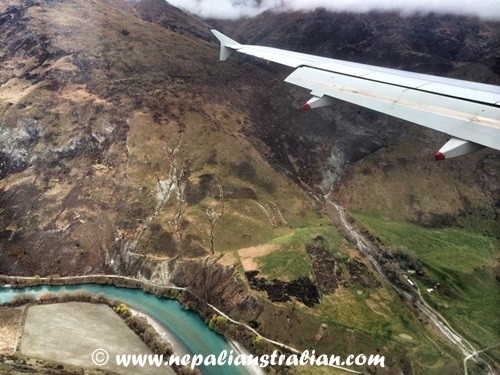 I would have to say that one of the most spectacular moments is when you are flying in to Queenstown on the plane. The view is absolutely breathtaking and it always reminds me of going to Kathmandu for some reason. Must be seeing the mountains as we come to land at the airport. The flight was only 3+ hours so we entertained ourselves with many episodes of Big Bang Theory and Modern Family. We also had a light snack of chicken sandwich and tea on-board. The flight was smooth except for the time when we were close to landing and it got a bit bumpy. The plane fell for a split second and it felt like I was in a roller-coaster ride. Even though I have flown so many times, it always scares me when they announce a thunderstorm for the very reason. I don’t want to be on a plane which loses altitude suddenly. When we landed, we realised that it had been raining. We caught a cab to our hotel and it was drizzling all the way. The lady at the reception told us that it was the first rain in 29 days in Queensland and me and AS looked at each other and hoped it would stop and not ruin our trip. We definitely needed days with the sun out so we could enjoy the beautiful place. 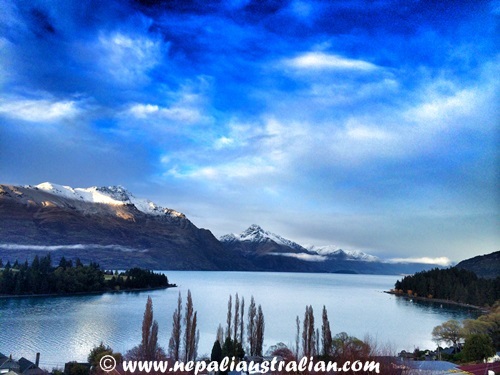 As I mentioned in my previous post, one of the best thing about Queenstown was the view from our hotel room. 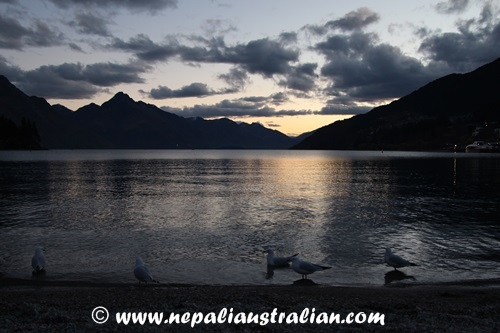 It was in front of the Lake Wakatipu with the snow-capped mountains in the background. Coincidentally, I realised that it was the same hotel I had stayed at when I visited previously as well. Must be the view that was bringing me back again and again to the same hotel. Since it was already afternoon, we decided to spend the rest of the day exploring the town itself. And honestly, it was worth every minute. 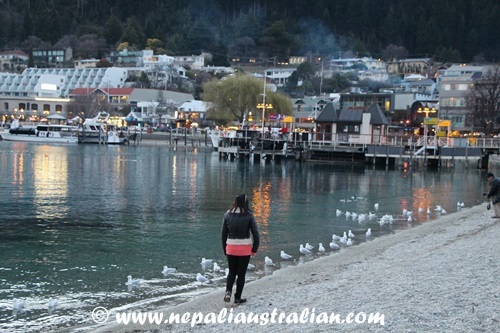 The people, the view, the environment; everything about Queenstown is just amazing. We had already booked a few trips and a car for the next few days so it was nice just walking around the town. 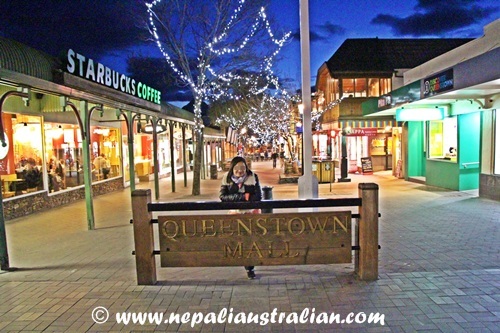 Apart from walking to the town and enjoying the views and shopping round Queenstown Mall, we went to a few other places in Queenstown. One of the sunny afternoons, we decided to go on the Gondola to the top of Bob’s Peak. 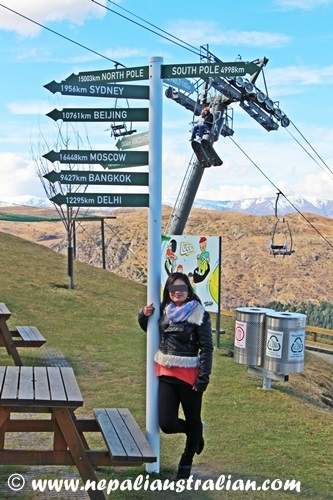 The Gondola skyline sits atop the steepest lift in the Southern Hemisphere, with a top terminal reaching half-a-mile high. Once we were on the top, the view was spectacular. The water in the lakes truly is as blue as my photos show as the lake is fed by a glacier. We spent a couple of hours on the viewing platform outside the restaurant observing the Luge, Hand-gliding and the 360 degrees of spectacular sights over the Bay and surrounds in the brilliant sunshine. Another hugely memorable highlight of our journey. There is also a very nice restaurant and some cool gift shops where you get off the gondola and we could not resist the lunch and dessert there. The food was nice and the view priceless. I loved this sign at the top and could not resist taking a photo :). Everyone who has been to Queenstown before constantly talked about the famous Fergburger and for some reason I had missed it the last time so we decided that we had to go there while we were in town. This burger is so amazing and it is only found in Queenstown. This place is so popular that it is always busy every day. The evening we went was no exception but we got a seat after we ordered. We order Cockadoodle Doo (chicken burger and chips) waited 15 minutes for it to be ready. I have to say it was worth the hype and the money as it was very flavoursome. The burger was almost as big as my face and I couldn’t finish it all. 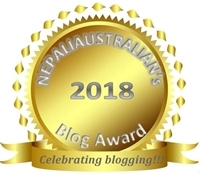 It is amazing to meet Nepalese people wherever we travel. 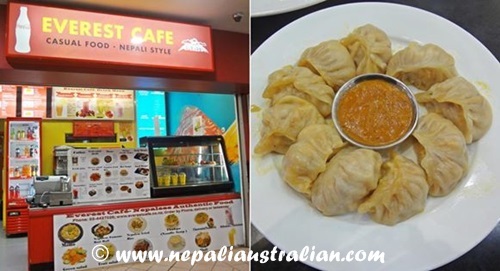 As far as I know there were not that many Nepalese people living in Queenstown but we were so delighted to find a Nepalese café in the middle of the town. We had momo there and it was really tasty as well. Made from scratch and very juicy. 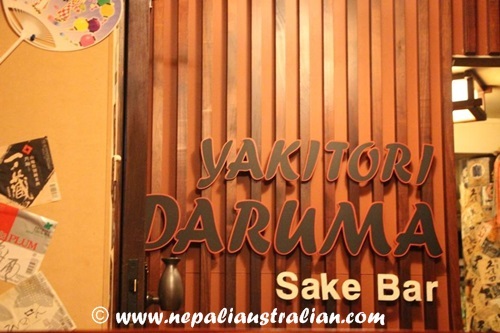 A nice cool Japanese place. AS wanted to have some sake so we tried it out, he loved it. The ambiance was great and we loved the food too. Very cosy and staff were good too. The guy at the information centre recommended this Indian restaurant to us. The restaurant was really busy but we enjoyed our food. Because we ordered the set menu, it was two much food for the two of us but it was very nice. More posts from New Zealand soon. 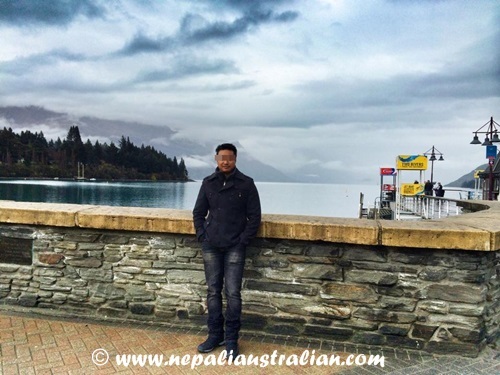 This entry was posted in New Zealand, Travel and tagged Bombay Tandoori, Cockadoodle Doo, Eating in Queenstown, Fergburger, Finding Momo, good time, holiday, incredible journey, M from nepaliaustralian, Milford sound, nepali australian, Nepaliaustralian, New Zealand, personal journey, Queenstown, Sake bar, Skyline Gondola, writing. Bookmark the permalink. New Zealand is on my list of places to visit one day. Glad you have the opportunity to! You must go there Sid, such a beautiful place and amazing people too :). You will love it. Wow. Which camera is used for this video? oh wow, looks like you two had an amazing holiday..view is absolutely breathtaking. 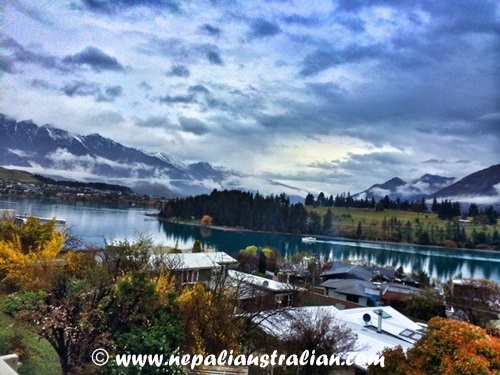 I love Queenstown too for the exact same reasons as you do. 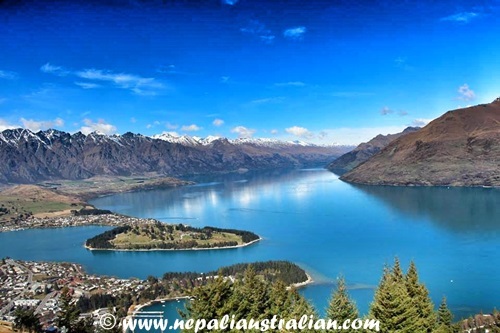 NZ is a beautiful place and you are always welcome with you queries. Take care TP.